During 2016, Canadians celebrated the 125th Anniversary of Ukrainian immigration to Canada. It is therefore fitting to remember Father Nestor Dmytriw - the first Ukrainian Catholic priest to celebrate the Divine Liturgy in Canada (at Terebovlia, Manitoba in April 1897). 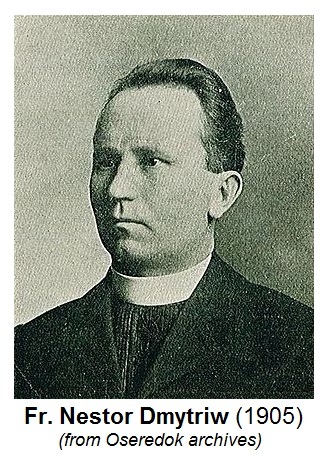 In addition to his spiritual duties as a priest, Father Nestor Dmytriw was an avid historian, a natural leader, editor-in-chief of the Ukrainian language newspaper "Svoboda" and a Supreme Secretary and Auditor of the Ukrainian National Association (previously the Ruthenian National Association). 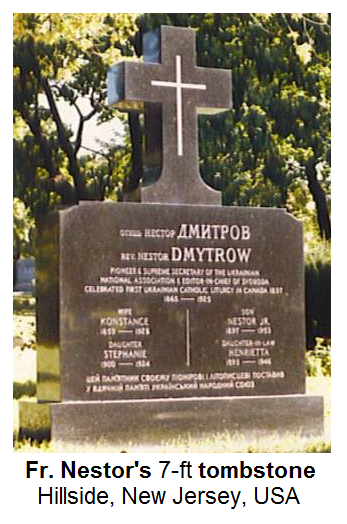 Father Nestor Dmytriw died on May 25, 1925 and is buried at Evergreen Cemetery in Hillside, NJ. Ironically, Father Dmytriw's gravesite was unmarked for over 60 years. He was the "forgotten priest" who had done so much for our early Ukrainian settlers in Canada and the USA. One of our Immaculate Conception Ukrainian Catholic Church Hillside, NJ parishioners, Olga Shatynski, happened to be visiting the Ukrainian festival in Dauphin, Manitoba in 1981 with her family and coincidentally picked up a brochure which mentioned that Fr. Dmytriw was buried in Hillside/Elizabeth, NJ. After visiting Fr. Dmytriw's gravesite and seeing no marker, Mrs. Shatynski launched a 4 year effort to find surviving relatives of Fr. Dmytriw in order to ask permission to have a monument placed on his gravesite at Evergreen Cemetery in Hillside, NJ. After painstaking research via various Records Offices in many towns (and before the days of Internet searching), Mrs. Shatynski found a surviving direct relative of Fr. Dmytriw and received permission to have a monument installed. Through the financial support of the Ukrainian National Association, our Hillside, NJ parish coordinated the effort to erect a 7 foot monument of Portuguese black marble on Fr. Dmytriw's gravesite. The monument was dedicated on October 24, 1985. Thus, the "forgotten priest" would be remembered forever. What is amazing is that our Hillside, NJ parish had absolutely no connection to Father Nestor Dmytriw (our parish was founded in 1957 - 32 years after Fr. Dmytriw died). To this day, our Hillside, NJ parishioners visit Fr. Dmytriw's gravesite to say prayers for the repose of his soul. The "finding" of this "forgotten priest" happened because of a Hillside, NJ parishioner and her family visited the Ukrainian festival in Dauphin, Manitoba in 1981 and happened to read a particular brochure that mentioned Fr. Nestor Dmytriw. It is amazing how God works through people in mysterious ways. Most importantly, a great and humble servant of God, Fr. Nestor Dmytriw, is now remembered and the repose of his soul prayed for at his gravesite to this day. It is difficult for us to imagine the hardships that Fr. Nestor Dmytriw encountered as he attended spiritually to the early Ukrainian settlers in Canada. His writings in the Svoboda talk about traveling barefoot through swamps in Canada to visit the various Ukrainian settlements in Canada and having to walk large distances because the trails could not accommodate wagons. Father Nestor Dmytriw also talks about temporary accommodations at the Immigration Home in Dauphin, Manitoba as "People crowd together in the building like a swarm of flies. It is dark and noisy: a dim light coming from a small lamp barely lights one corner of the shack." As Canadians reflect on the 2016 celebration of the 125th Anniversary of immigration of Ukrainians to Canada, let us all remember one of the greatest spiritual and community leaders of those undoubtedly difficult early days - Fr. Nestor Dmytriw - the first Ukrainian Catholic priest to celebrate the Divine Liturgy in Canada! Vichnaya Pamyat! Eternal memory!